Earn up to 3,085 reward points. 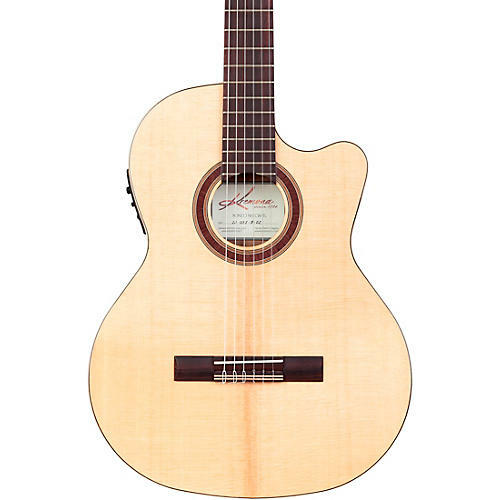 Sleek, single-cutaway classical with Fishman Classic 3 electronics. Kremona's acoustic-electric Performer Series is designed for players demanding handcrafted tradition and the option to plug in and be heard from the stage. The Rondo Thin Line ships with a Fishman Classic 3 pickup system - designed to capture the balance and warmth of a nylon-string guitar. Featuring a laminated walnut body with a solid spruce top, the Rondo TL is accentuated by a soft Venetian cutaway that allows exploration of the upper frets. Other accoutrements include an African mahogany neck, Indian rosewood fingerboard, wood binding and rosette, and gold-plated machine heads with amber buttons. Includes CGGB-TL deluxe gig bag.